After adapter Graham Abbey’s slicing and patching up of the first two plays of Shakespeare’s Second Tetralogy of history plays, one tends to look forward to his needless surgery on its second two plays more with apprehension than excitement. Henry V, the conclusion of the series, is so well constructed and so full of life and irony that it is quite often presented on its own. Laurence Olivier’s classic 1944 film and Kenneth Branagh’s popular 1989 film of the play attest to is success as a separate work. To ruin its structure by squashing it in with another play seems sacrilege. To precede it with Henry IV, Part 2 will likely put off people who would be happy to see Henry V on its own. As with its predecessor Breath of Kings: Rebellion, Breath of Kings: Redemption manages to ruin the experience of two full-length plays by cutting them to fit into only three hours. 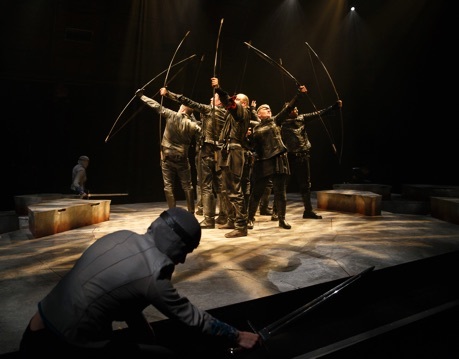 Henry IV, Part 2 may be the play of the Second Tetralogy least performed in isolation, but those who have seen a full-length production of it, like Stratford’s own in 2001, will know that it is in many ways the most modern of the four. Its cynical humour, its portrait of a nation in decay, of a political leader and a populace who are both diseased is very close to a contemporary worldview where a nation breaks into factions and its leaders are too weak or too self-serving to unite them. Given the coming election in our neighbour to the south, this would have been a perfect time to stage a full-length production of Henry IV, Part 2 and to relish Shakespeare’s bitter satire of politics and politicians. Instead, the play appears to have been been cut down to 90 minutes and Henry V to only 65. These times are misleading because Abbey adds parts of the first act of Henry V to the ending of Henry IV, Part 2. This is not a good ploy because it shifts the focus off the newly crowned HenryV’s rejection of Falstaff and onto his preparations for war against France. Falstaff has hardly taken in the king’s decree of banishment when Abbey whisks us into Act 1 of Henry V with the Archbishop of Canterbury and the Bishop of Ely plotting a war against France. We learn of Falstaff’s death (from Act 1, scene 3 of Henry V) and then have the tennis ball scene (Act 1, scene 2) all before intermission. In linking Henry IV, Part 2 to Henry V, Abbey does miss a trick since the earlier play is the first in the tetralogy to use a Chorus while Henry V is famous for its use of a Chorus. Abbey might have made the opening Chorus of Rumour the Chorus of Henry V, but he cuts the Chorus of Rumour entirely along with the Northumberland plot which parallels the Henry IV plot. Even though he has already launched into the plot of Shakespeare’s Henry V before the interval, Abbey saves the first appearance of the Chorus until after the interval. The Chorus opens with Shakespeare’s first speech for the Chorus but switches partway through to its speech before the Act 2. This, of course, ruins the entire structure of the play. In Shakespeare’s original the Chorus speaks before the action begins, at the start of every act and at the conclusion. The point is that the entire action of the play of Henry V is enclosed within the Chorus’s narrative. The reason for this is that Shakespeare is taking the surprisingly modern view of investigating how history becomes legend and in turn becomes fiction. The entire Second Tetralogy is preoccupied with that favourite Renaissance theme of appearance and reality, one of many reasons that it is false to think that the history plays are only about history. 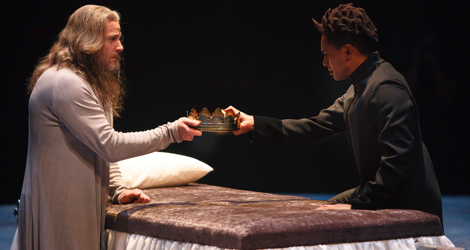 Richard II presents a person with all the appearance and divine sanction of a king, but who abuses his position. Henry IV may be the de facto King of England, but he is painfully aware he does not have the divine sanction to be king and begins to waste away under the burden of his guilt. In Henry IV, Part 2, Shakespeare makes his first use of a Chorus, of Rumour no less, to suggest that the entire kingdom is entering a realm of unreality as a country ruled by a king who is not really its rightful king. By Henry V, the move to unreality is complete with a Chorus who underscores with every speech the artifice of everything we see. One side is the artifice of stagecraft attempting to represent reality, but the other side is the artifice of the very story it is telling which, like a fairy-tale, ends with a Prince Charming winning the beautiful princess. Abbey’s cuts undermine this overarching theme of the Second Tetralogy. He cuts the Chorus’s speeches so much that he appears like a commentator on the action rather than the presenter of it. He severely cuts The Archbishop’s hilariously long and complicated Salic Law speech by which Shakespeare shows just how contrived Henry’s justification for war against France really is. In Abbey’s version the war seems fully justified. Abbey cuts the characters of the Irishman Captain Macmorris and the Scotsman Captain Jamy leaving only Welshman Captain Fluellen. The point of having all three is to show how Henry V has united the three fractious parts of Great Britain with a war against a common enemy. In Henry’s nighttime tour of the camp in disguise, he encounters a soldier Williams, who disagrees with the King’s policies. Abbey gives us the argument but not the follow-up when Williams realizes later with whom his was arguing. Abbey cuts Henry’s long soliloquy “Upon the king! let us our lives, our souls” concerning the the vanity of “ceremony” that surrounds a king which is there to make us see how aware Henry is of kingship as a role that he must play. To lose this speech loses the connection of Henry V to Henry IV and to Richard II, who both speak of the pains of kingship. If Araya Mengesha was lacking as Prince Hal, he is woefully inadequate as Henry V. Henry V is a natural orator and often it seems as if he is able to hold the country and his men together simply through the force of his oratory. But Araya Mengesha simply lacks these skills. He speaks all lines, no matter what the mood, in the same short-breathed style with an unhelpful habit of lowering his volume toward the end of each phrase where the more significant words are usually located. He uses three volume settings – loud for anger and rallying troops, soft for sadness and medium for everything else. The late director Robin Phillips used to say that it took an actor at least two years of practice to be able to speak Shakespeare properly. Mengesha does not have that background and it is painfully evident. There are others who are or used to be at Stratford who do have those skills. This will be the second time now after the last Henry V in 2012, when an actor has been parachuted into one of the greatest roles in Shakespeare thus excluding those who have much more experience in Shakespeare from likely ever playing the role. It is a situation unfair to Mengesha, unfair to the actors excluded and unfair to the audience to deserve to have some of Shakespeare’s greatest speeches spoken with the greatest skill. One of the former great Henry Vs at Stratford is now one of the great Falstaffs, namely Geraint Wyn Davies. He makes Falstaff’s excitement that Hal is now king followed by his public rejection by the king into the most moving moment of the two plays. The way he makes his face change from disbelief to consternation to hidden grief is both masterful and heart-rending. Wyn Davies reappears in Henry V as Fluellen and thus Stratford at last has a Welsh actor playing the role of the famous Welshman with an authentic Welsh accent. Though Abbey has severely curtailed the role, Wyn Davies is still able to distinguish completely the fat vice-ridden old man from the intense middle-aged stickler for following the rules. In Henry IV, Part 2, Graham Abbey finally comes into his own as the title character. Abbey shows that even as Henry’s body fails him, Henry mind is still full of suspicion, remorse and stratagems. Richard’s well-known reflection of his life is, “I wasted time, and now doth time waste me”. Henry did not waste time but leapt to take the crown when he could, but the result is that time wastes him more lingeringly than it did Richard. Abbey could spare us some of the violent bodily spasms he gives the dying Henry, but overall he presents us with a man who, despite everything, is cunning to the last when he tells Hal that the way to keep the crown is “to busy giddy minds / With foreign quarrels” – advice that politicians still follow to this day. Tom Rooney is very funny as the ancient Justice Shallow, who makes much of his own wit, which he does not have, and of great adventures in the past that never happened. Rooney also appears as the Chorus in Henry V. The main peculiarity here is that co-directors Weyni Mengesha and Mitchell Cushman have decided that he should look exactly like Richard II. Since Rooney is listed as the “Chorus” in the programme, one wonders how this costuming makes any sense. Why should the ghost of Richard II even be interested in telling us the story of how the son of the man who usurped his crown won victory in France, except for his final lines when he says how Henry VI lost it all? If so the costuming is far to confusing for such a payoff. Abbey has cut the Chorus’s speeches so much that Rooney can hardly give them an interpretation, ironic or otherwise. As it is, they appear neutral and, since their pacing through the play has been spoiled, pointless. Other actors shine in Breath of Kings: Redemption. One is Sébastien Heins who has a fine scene as Henry’s brother John of Lancaster. Heins makes John frighteningly icy in character, able to deceive the rebel Archbishop of York and his followers without the least care. For her part, Carly Street, though bizarrely costumed in a sleeveless kirtle, brings out such sincerity and nobility in the Archbishop that it makes John’s coldness appear doubly cruel. Randy Hughson is in fine rambunctious form as the aptly named Pistol who is constantly shooting off his mouth, and Irene Poole is suitably severe both as the Lord Chief Justice who hounds Falstaff and as servingwoman Alice who attempts to teach the French princess English. Kate Hennig returns as a lively Mistress Quickly, but, strangely, she delivers the well-known speech concerning the death of Falstaff with little emotion. In this she is not helped by the direction which rushes this scene and does not allow it to resonate as it should. Mikaela Davies must score a first in productions of Henry V in playing both the Dauphin of France and Princess Katherine. She seems like only the slip of a boy as the Dauphin and since Abbey has cut most of his lines, we don’t get the humour of his boastful nature. She does, however, make a fine Katherine showing an attractive spiritedness during the French lesson and a playful coyness in Henry’s wooing scene. It is possible to make the wooing scene heavily ironic. After all why should Katherine fall in love with a man who has just conquered her country and killed so many of her compatriots? Unfortunately, the co-directors do not take this route because they have Katherine kiss a mannequin wearing a crown after the French lesson as if the princess were someone already in love with a man she has never seen. The set designed by Anahita Dehbonehie for both parts of Breath of Kings actually displayed a greater insight into the plays that we get either from Abbey’s cut-up text or from the direction. 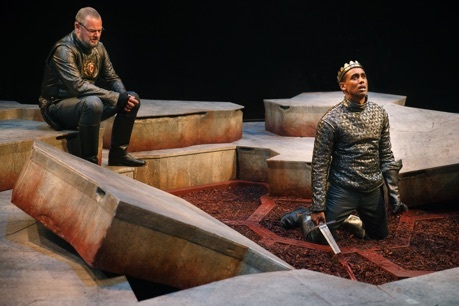 For Richard II, the stage platformed is covered in redwood chips representing the “dear earth” of England that Richard extols on his return from Ireland and that John of Gaunt praises as “this other Eden”. For Henry IV, Part 1, this earth is swept away revealing a platform of irregularly shaped fitted stones. This suitably represents the hard world that Bolingbroke’s Realpolitik has made in deposing God’s deputy on earth. In Henry IV, Part 2, a vaguely coffin-shaped stone of those making up the stage is taken out, set upon the stage and never replaced. This brilliantly serves as a constant reminder of the death of Richard II that has so haunted Henry IV as to make him feeble and unwell. During the course of Henry V, more of the stone of the platform are removed until they make two pits representing the English and the French camps. By the end of the play the removed stones are in complete disarray so that when France is referred to as “the world’s best garden”, the irony is heavy since it is clear that war has already destroyed that garden. At the end of Graham Abbey’s six-hour “distillation” of the Second Tetralogy it feels like a waste of time. The “distillation” has nothing of the fullness of vision and detail of the complete plays and the actors are deprived of the richness of their characters that their unabbreviated lines would afford. Abbey’s version does provide an overview of the plot but cannot give the echoing of themes and characters or the multiple ironies that mark the full-length plays. Seeing the First or the Second Tetralogies of Shakespeare’s English history plays is one of the greatest theatrical experiences a theatre-goer can have. No other playwright of Shakespeare’s time attempted so grand a project and no other playwright embodied so grand a vision of people’s interactions with each other and how they fit into larger schemes of nature and divine judgement. For now Stratford has deprived theatre-goers on such an experience. Let’s hope that some day the Festival wakes up to what a gift these plays are and treats them and its audience with the full respect they are due. Photos: (from top) Graham Abbey as Henry IV and Araya Mengesha as Prince Hal; the cast of Henry V; Geraint Wyn Davies as Fluellen and Araya Mengesha as Henry V. ©2016 David Hou.